I'm playing catch up with movies I saw over the past summer but didn't have time to write about, beginning with Man of Steel. Beware, spoilers! I have no objection to a film rooted in a pessimistic worldview – provided the narrative is thoughtful and the filmmakers resist the impulse towards bad faith nihilism. Though cynical, Man of Steel is thankfully not bleak. It does, however, falter unpleasantly in the by-now infamous third act climactic confrontation. Up until that wrong turn, the film is astonishingly good. Krypton’s depiction lives up to the finest science-fiction traditions with richly rendered culture and technology that is appropriately alien and ungraspable despite its surface humanity. The reimagining of General Zod as a patriot intent on restoring Krypton – politically in the light of a government he disagrees with and then literally after its destruction – rather than as a criminal offers a refreshing and surprisingly personal take on a classic Superman villain. As the catalyst for Clarke Kent’s rapid evolution into Superman, Zod’s conception drives forward an exciting plot that twists the alien invasion narrative into something more than the product of megalomania. Most importantly, Goyer’s script offers a credible portrait of an alien in an alien land, struggling to find a place in a world that would fear him for his superhuman ability – at least, if Kevin Costner’s portrayal of Pa Kent is to be believed. Insofar as Clarke spends the movie defining the balance between the humanity of his unbringing and the otherness of Kryptonian heritage, Man of Steel offers surprising depth. Of course, this leads me to declare the handsome man himself, Henry Cavill, as perfectly suited to the role with a rugged physicality that balances Superman’s square-jawed nobility with Clark Kent’s human vulnerability. 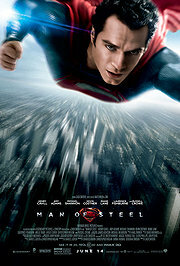 Cavill makes it inviting and effortless to invest’s oneself in Kent’s journey from confused everyman to a Superman. Other cast members are also wisely chosen for their roles, with Russell Crowe especially noteworthy as Jor-El, the scientist who foresees Krypton’s demise. He brings great dignity to the story as the sole memory of a dead world to its last son. Yet Snyder’s talent for spectacle, an asset in depicting a clash of titans to earth-shattering effect, is betrayed by his thoughtless exuberance. Once the movie trades drama for fisticuffs, not even the appropriately-named Smallville is spared from the excesses of collateral damage delivered with flair but without moral awareness. The issue is not so much the fact of destruction, but that it occurs without Superman’s consideration for consequences, a lapse that seems distinctly uncharacteristic for a character conceived as a paragon of virtue. "In ancient mythology, mass deaths are used to symbolize disasters,” says Snyder in response to criticism of his callous display of mass destruction. Here’s a brief memo to the director: mass deaths are not symbols of disasters, they are disasters. His inability to make the distinction trivializes his efforts at serious storytelling and undermines the very mythology he aims to create. Nowhere is this fault more apparent, or disheartening, than in Snyder and Goyer’s decision to have Superman kill Zod rather than, as Christopher Nolan apparently preferred, returning him to the Phantom Zone in which he had previously been imprisoned. Ostensibly intended to lay the foundation for Superman’s aversion to killing, the scene suffers immediately from awkward and unconvincing staging – Zod about to burn an innocent family to death with heat-ray vision. (Couldn’t Superman just have put his hands over Zod’s eyes?) Once past the twist’s credibility, or lack thereof, the shallow moral reasoning underlying the decision to turn Superman into a brute becomes apparent. Question: why is it necessary for a man to kill someone in order to appreciate the value of not killing when he spends his entire life in fear of causing harm through his superior strength and powers? Answer: the decision makes no sense as it reinforces a point that doesn’t require reinforcement. Just as The Dark Knight ended on a strange and false moral dilemma, Man of Steel uses a contrived quandary to resolve a plot point and defer character development to a future installment. What Man of Steel ultimately lacks, then, after a movie setting up a fearful world on the brink of destruction, is the hope that Superman is meant to embody. Although I’ve never been a fan of the character, preferring to stake my flag in Batman’s camp, I have come to appreciate the contrast he presents to his grim Gotham counterpart thanks to J. Michael Straczynski’s Earth One series of graphic novels. Yet that contrast is not so evident in Man of Steel. More than merely a superior physical being capable of wielding great brute force, Superman is distinguished from the fascist superman criticism often leveled against superheroes through his qualities of self-sacrifice, willingness to put himself at risk, and the way in which he deploys his power in the aid of those with none. Forget notions of moral complexity; Superman works best as the hero who makes the right decision no matter what, precisely because it is the right thing to do. The fact that most humans aren’t capable of such clarity, or willing to stand up for principle, is arguably what makes Superman so, well, super more so than the ability to fly. At least, that’s my impression of how it should be. Man of Steel, though beautiful filmed with moments of genuine heart and concussive action, ultimately proves to be Man of Lead, the case study for what is problematic about Hollywood’s treatment of superhero stories. Considered in conjunction with The Dark Knight Rises, Man of Steel even raises questions as to whether Christopher Nolan and David Goyer are well-suited to two of our most iconic comic book characters. Nolan et al ultimately dismantled Batman, reducing the character to a neurotic reactionary with high-tech toys who, ultimately, finds peace by abandoning the cape and cowl. And this, after a movie that undermines the character’s rationale – such as having Catwoman kill Bane in a repudiation of Batman’s no guns / no killing policy. This isn’t to say Nolan’s vision is wrong – a large part of Batman’s appeal other than his style and grim humanity is his malleability – but that it is a vision that ultimately doesn’t mesh with my understanding of the character. Still, if Nolan and Goyer’s take on Batman, inspired by Frank Miller’s crypto-fascist interpretation, doesn’t appeal, there are plenty of other versions to latch on to. For me, I go for the cool professional, noir detective interpretation as in the Animated Series and some comics (e.g. Dean Motter’s Batman: Nine Lives) and the gothic hero of Tim Burton’s films. Failing to build up the character after tarnishing him in The Dark Knig, Nolan’s last word on Batman in The Dark Knight Rises struck me as an argument against the character. (See my review here.) Similarly, the vision of Superman driven by Snyder and Goyer with Nolan’s imprimatur also strikes me as a refutation of the character rather than an affirmation. In both franchises, idealism is rejected in favour of cynicism stamped as “realism,” a decision that betrays the possibility of heroism and the ability for individuals to inspire others to be better. It ultimately embodies the philosophy of raw power, the triumph of the strong over the weak, rather than, say, Enlightenment ideals. Both Batman and Superman in the Nolan-verse of films achieve their exalted state because of their ability to outfight their opponents, not because they act according to a superior ideology. Marvel is not the answer to all this gloom. Although lighter and chock-full of alternately fun and tedious escapism, the Marvel film universe shows all the signs of indulging what I find unappealing about mainstream comics: a propensity for escalating the fantastical into nonsense, and soapy operatics in which narratives have no force since anything and everything is possible. Marvel’s films are harmless in that they pit superpowered heroes against similarly superpowered villains ordinary mortals stand no chance against. Yet that too a reductionist view of good versus evil that, with a few exceptions such as Spider-Man, is so insubstantial it puffs away once the story comes to an end. So what happens next for comic book movies, if Marvel and DC only put out profitable but hollow products?